This weekend we were going through my daughter’s clothes and we found a ton of plain leggings that she rarely wears because the are just really old, slightly stained or just plain ugly. I decided to do a few things to them to bring them back to life instead of throwing them away. 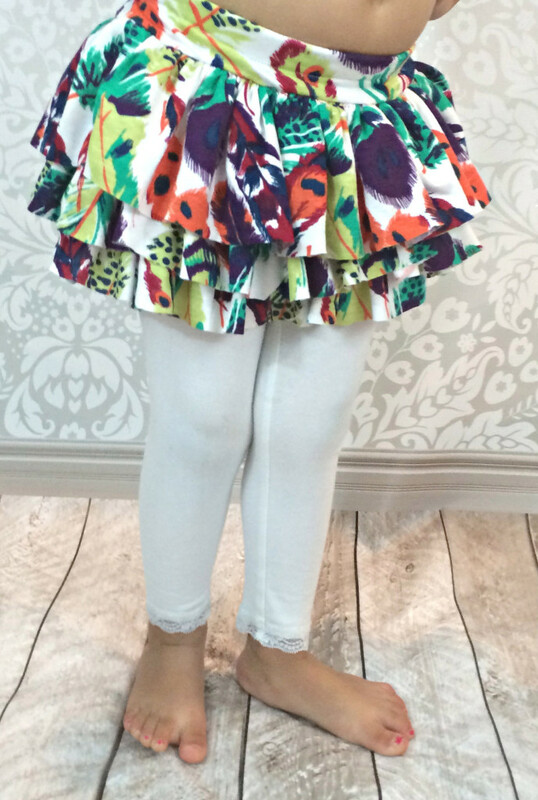 I added lace to the bottoms of a few, some tulle around the waist of others and for this one, we added some ruffles. 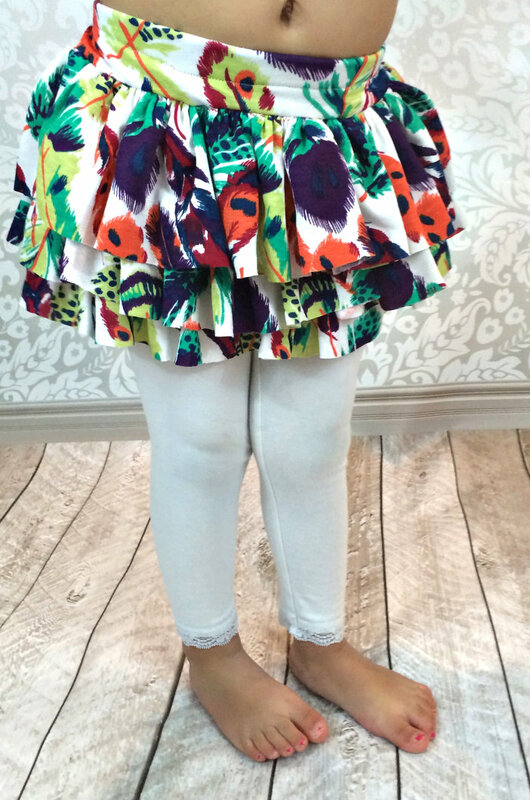 This one is her favorite cause she can twirl around in it. 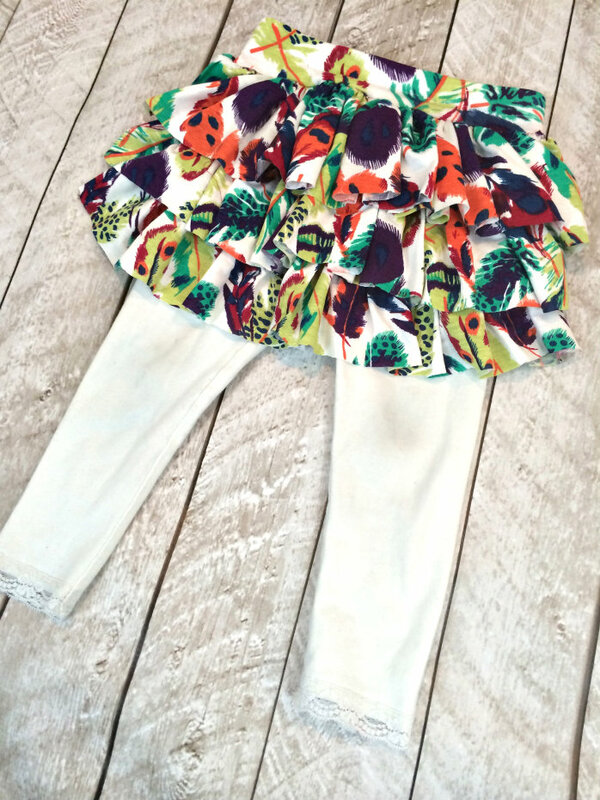 Here is a super easy tutorial on how to add ruffles to any pair of leggings. 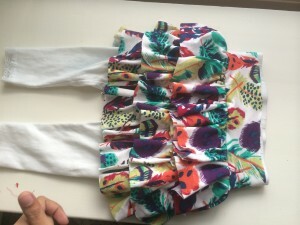 It’s best to use knit fabric to add ruffles so that you dont have to do a lot of hemming . However, regular cotton will work just fine too. 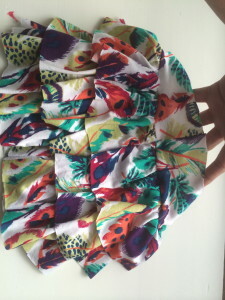 The fabric used here is from Girl Charlee called Feathers on Silver Peony. It’s a jersey blend which gives a nice stretch for play. 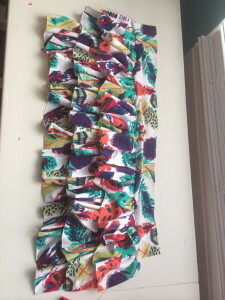 I love the colors of this fabric on the white contrast. It really highlights the fabric. I am tempted to make a ruffle skirt for myself with this fabric. 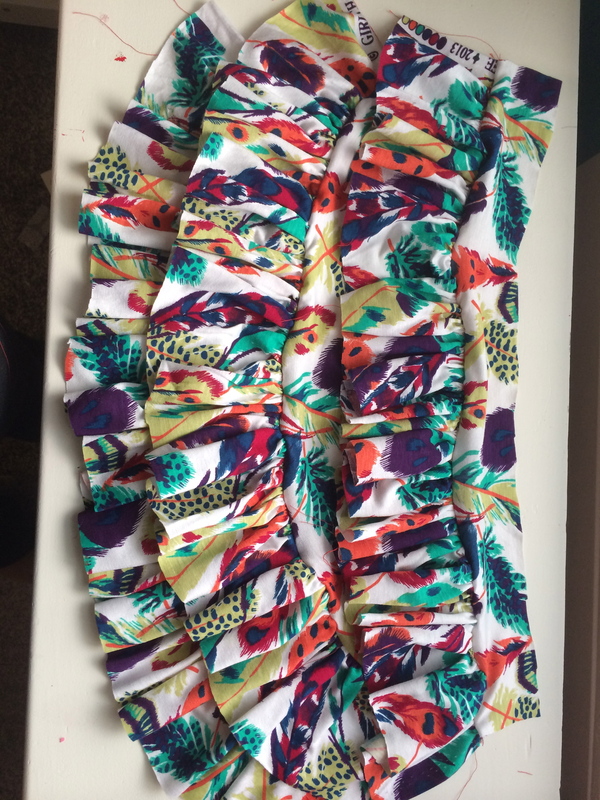 Measure how long you want the ruffle skirt to be + 2″ allowance. Take that number divide by 3. 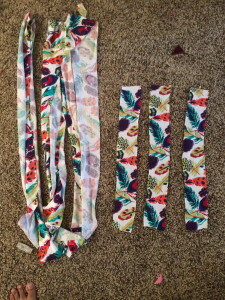 That would be the width of each of your 3 strips. 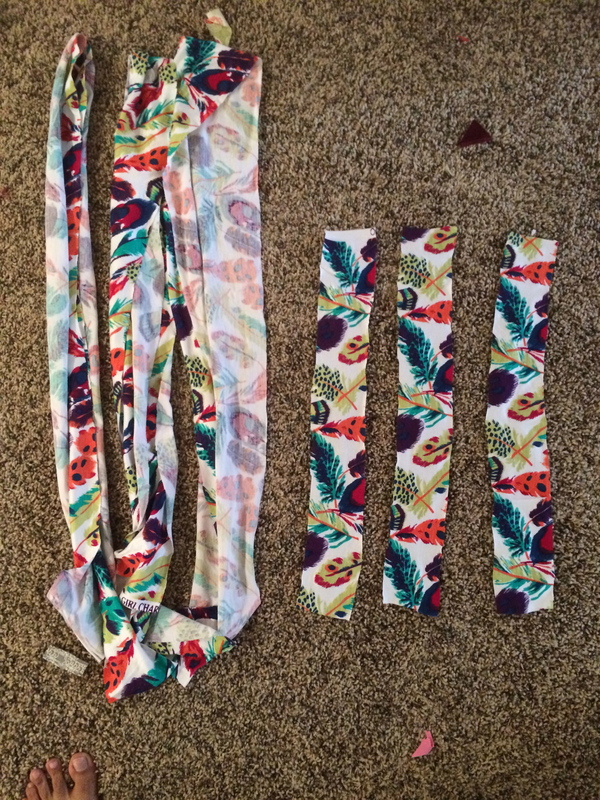 To get the length, take the waist measurement from the legging and multiply it by 3. 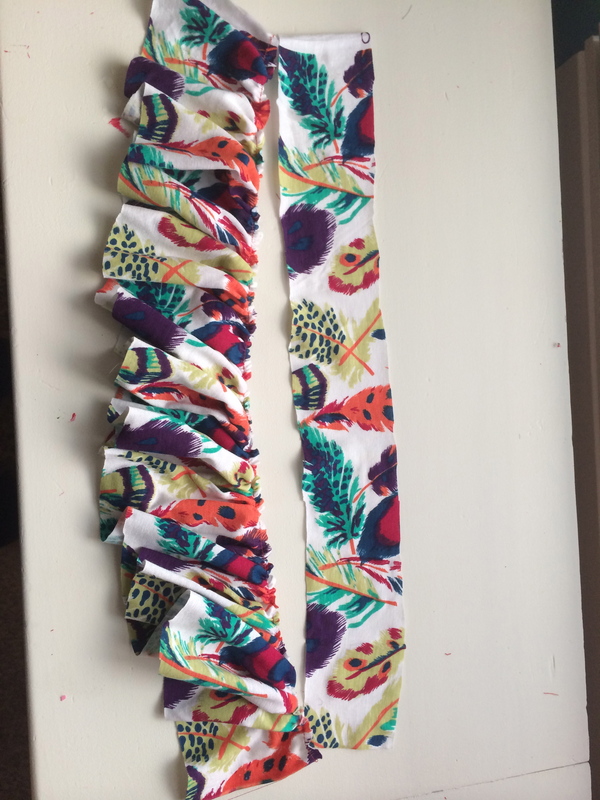 So for mine, I wanted the overall length to be around 10″, so 10+2+12. Then 12 divide by 3 equals 4. 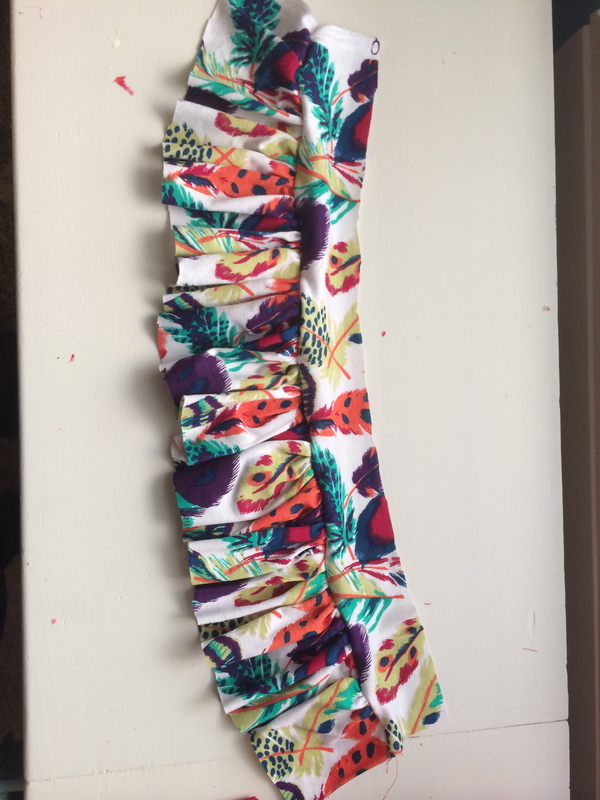 4 ” is the width of my strips. The waist of my legging was 20″. 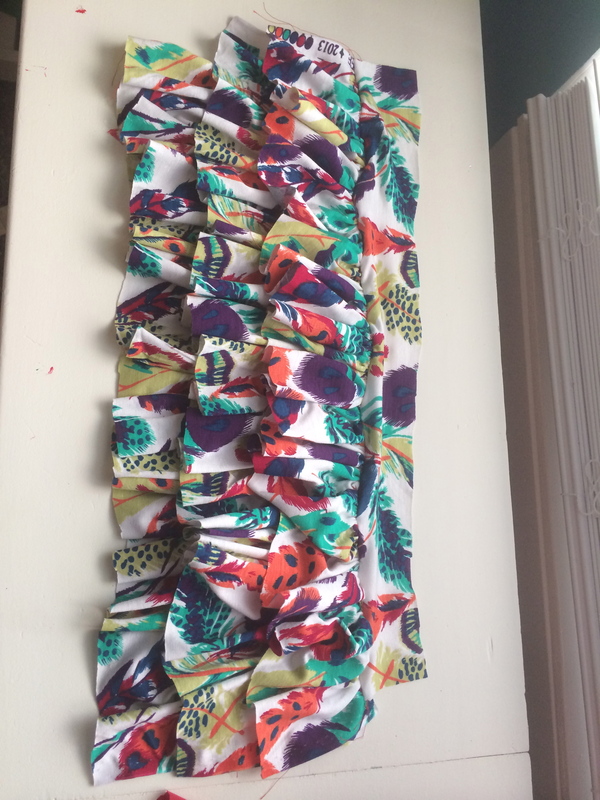 After I multiplied that by 3, my 3 ruffle strips measured 4″ x 80″ long. 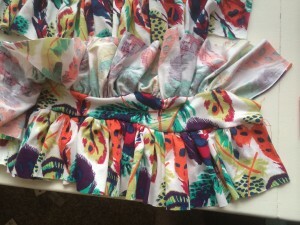 You dont have to do yours that long but the longer it is the fuller the skirt will look. 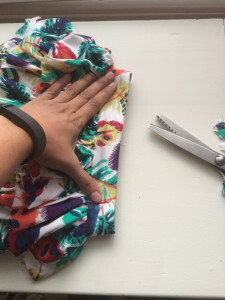 Next, take the measurement of the waist of your leggings and cut 3 strips with that length x 2.5″. This will be for the bands. My band measurement was 2.5″ x20″ each. 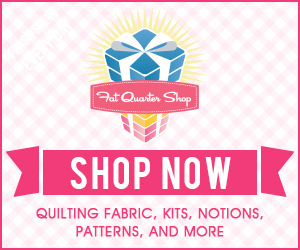 Now, take your long strips and do a gather stitch on the top (longest stitch length of your machine). 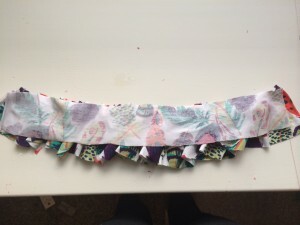 After you sew your long length stitch, pull it to make a gather that matches the length of your small strips. 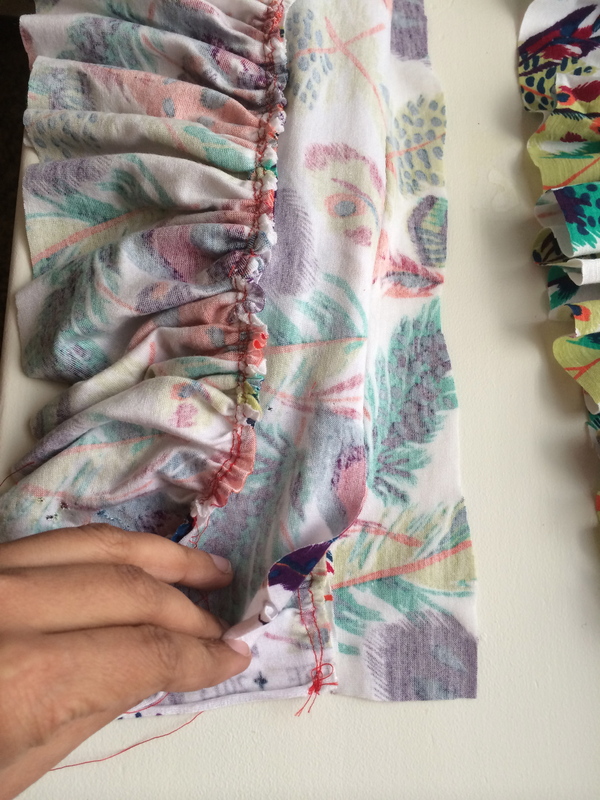 Sew the two pieces right sides together, remembering to turn back your stitch length to its normal setting. 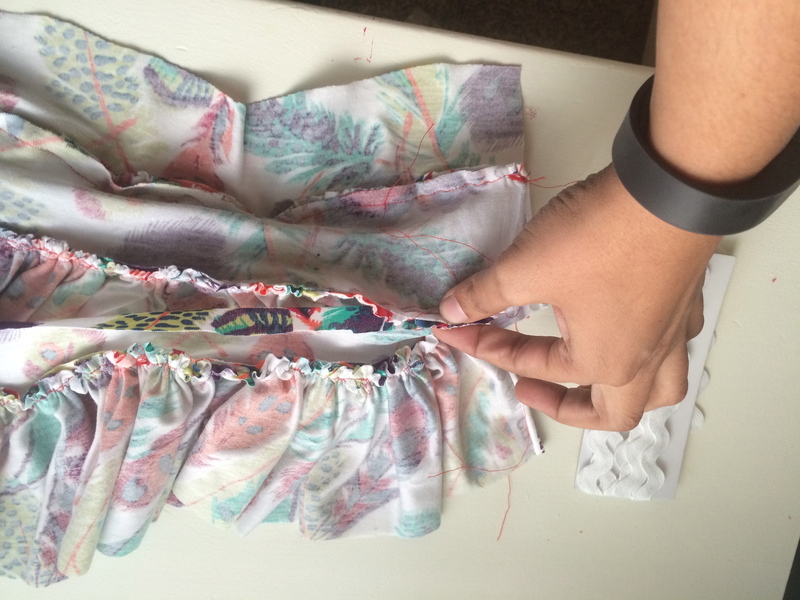 Follow the same process for the other two pieces until you have 3 ruffles. Now, we will sew them all together. 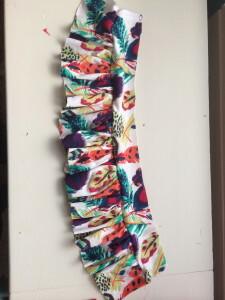 Take the bottom ruffle and line it up with the seam of the second ruffle. 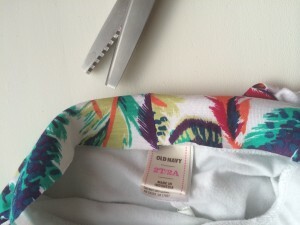 Sew, right on top of that seam. For the top one, you will have to line it up with the seam on the second ruffle. Now, fold the two ends together and sew right sides together. Make sure you line up your ruffles when you do, so it lines up perfectly at the back. You can pin to ensure accuracy. Now, take your legging and fit it under the skirt, aligning the backs together. Pull up the top part of the skirt and fold it all the way around the elastic of the legging, so that the legging is encased in the skirt fabric. 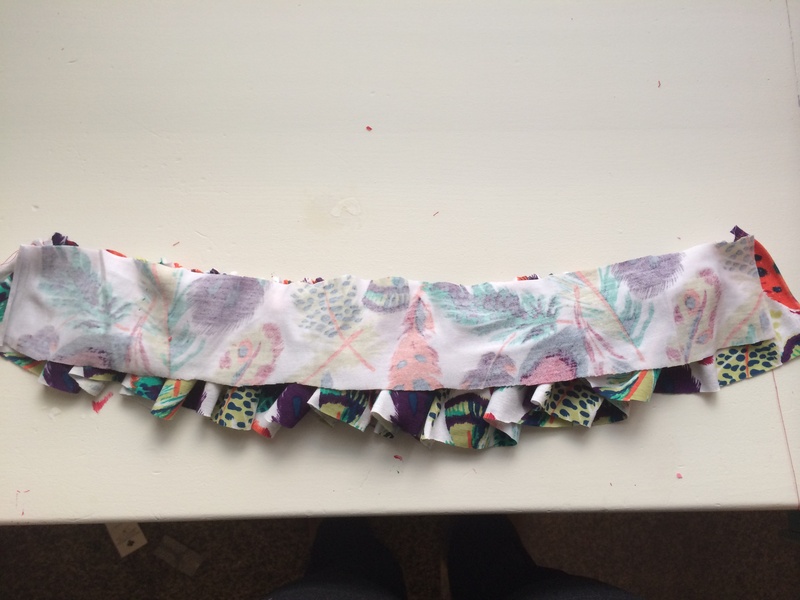 Pin and sew down. There you have it! Isn’t that adorable?